A few weeks ago, I got a text from my friend, Greg. 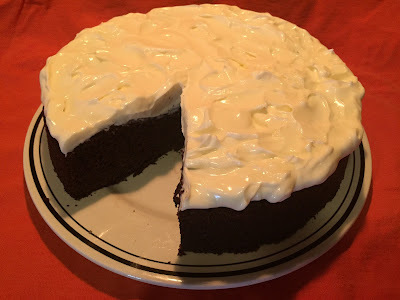 He was browsing my website, wondering if I had ever made a Chocolate Guinness Cake. I hadn't, but quickly did a little search to see which one I would recommend. I quickly found this recipe from Nigella Lawson (LOVE her, btw). It looked pretty simple and straight forward, so I sent him the recipe. Then I thought, well, I guess I might as well try it! All I have to say it OH. MY. GOD. This cake is HEAVENLY. It has a rich deep chocolate flavor with just the tiniest hint of a bitter note from the stout. And the cream cheese topping is just a pillow of lusciousness covering everything. Actually, it's so moist, you don't even need the topping, but it's CRAZY good, so you'll want to include it. It's SO easy to make too. Just follow the recipe as written, straight through, and you'll be good to go! So, thanx to Greg for the suggestion, and thanx to Nigella for the lovely recipe. This one is definitely a new favorite! Butter a 9-inch springform pan and line with parchment paper. In a large saucepan, combine Guinness and butter. Place over medium-low heat until butter melts, then remove from heat. Add cocoa and superfine sugar, and whisk to blend. In a small bowl, combine sour cream, eggs and vanilla; mix well. Add to Guinness mixture. Add flour and baking soda, and whisk again until smooth. Pour into buttered pan, and bake until risen and firm, 45 minutes to one hour. Place pan on a wire rack and cool completely in pan. Using a food processor or by hand, mix confectioners' sugar to break up lumps. Add cream cheese and blend until smooth. Add heavy cream, and mix until smooth and spreadable. Remove cake from pan and place on a platter or cake stand. Ice top of cake only, so that it resembles a frothy pint of Guinness. Instead of lining the pan with parchment, I just sprayed it with baking spray (the kind that has flour in it) and it worked perfectly! Also I didn't use superfine sugar. I just used regular granulated sugar. I'm guessing the superfine might give you a slightly different texture, but the regular granulated worked well enough for me. You could always blitz your regular sugar in the food processor for a while if you want superfine sugar. Next time, I think I'm gonna try making it in a bundt pan, just to see how it turns out. I kind of like the idea of the rich creamy topping cascading down the sides! Btw, if you want to add a different kind of stout, go for it! How about a chocolate stout? Makes sense to me! I like using heavy cream in the topping, just as it's written, just so it stays white to resemble the frothy pint of Guiness, but if you want a little extra something, try using Bailey's instead of cream. Delish!